Herbs help to support our whole body system in a natural, organic way, helping the body attain and maintain its overall vitality or life force. In supporting the immune system and nervous system, they act as a preventative to illness and in an age where there are so many environmental stressors, using natural, organic or wild crafted herbs specific to your own wellness and beauty needs supports the whole body holistically, not just waiting until we’re poorly and then concentrating on just the symptoms. We are living in a time where there is so much emphasis being put on the term ‘anti-ageing’ and there is a general social need to look younger than our years. I feel more focus should instead be placed on ‘healthy ageing’. Eating a balanced, nutritious diet, as well as incorporating certain herbs into your daily routine will help achieve this. Herbs such as elder, for example, are used to cleanse and detoxify the skin from the inside out. The tannins, flavonoids, bioflavonoids, triterpenes and high vitamin and mineral content help to mitigate the effects of premature ageing, protecting the body from cell damage. Gotu kola has been found to increase collagen production and rhodiola has the ability to counteract the effects of pollution. There are many ways in which herbs can be incorporated into our daily lives. They can be used fresh or dried in cookery, as a powder in a smoothie or can be obtained from a reputable supplier in tincture or supplement form. In beauty they can be used as a homemade toner, a facial steam or a hair rinse. You could even make your own balm. I would advise anyone who is pregnant or breast feeding, on prescription medication and those with a long-standing, chronic condition to always speak to their health care practitioner and qualified naturopathic physician before taking herbal medicine. I love a face mask after a long, stressful day and this is such a simple one to make. Matcha has a high nutrient and antioxidant content while honey has a great cleansing and detoxing action. It’s so easy to prepare and so very good! 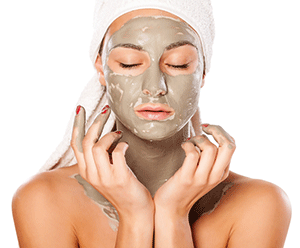 Mix these together to form a paste and spread on a clean, dry, face and neck. Leave for 20-30 minutes then wash off with a damp, warm cloth. In animal studies, ashwagandha has been found to be as effective as conventional medicinal hydrocortisone in calming inflammation and soothing irritated skin. Ashwagandha’s strong anti-inflammatory properties work well in relieving the symptoms of arthritic and rheumatic conditions such as pain, stiffness and swelling. The high levels of antioxidants within this herb help to keep the negative degenerative side effects of ageing at bay, and it has also been used with great success by athletes who put their bodies under great physical stress, helping with metabolism and vitality and enhancing their natural stamina. Pollen’s high nutritive and antioxidant content gives the skin a healthy glow, helping us to age gracefully. The flavonoids, phenolic acids and phytosterols in pollen and propolis not only help with inflammatory skin conditions such eczema and psoriasis, but also to boost the production of collagen. Propolis has a mild analgesic effect that helps stop pain and itching in irritated skin and soothes inflammation. It is believed to encourage cell regeneration. Green tea helps to stop the growth of bacteria in the mouth, helping to prevent tooth decay and bad breath. This doesn’t mean you can stop brushing though! Green tea’s high antioxidant content helps to keep the skin looking young and healthy, protecting the skin from environmental pollutants and helping in the prevention of premature ageing and UV sunlight damage. Nettle’s an important remedy when treating chronic skin conditions such as eczema, and is gentle enough for children too. For teenagers with troubling, oily, acne-prone skin, this is the herb to use every day. Consider nettle as a food for the skin and one of the best herbs in your anti-ageing regime. With regular use of nettle you’ll see stronger and healthier hair and nails as its high mineral content nourishes and strengthens. Oat tops are a perfect remedy for helping to repair the skin after burns and for soothing and calming common itchy skin conditions such as chicken pox, psoriasis, eczema and poison ivy rash. Milky oats are invaluable where there’s irritated skin, taken both internally and externally. As a hydrating bath, oats’ cooling emollient properties calm an agitated nervous system while rejuvenating and refreshing the skin. Rosemary has been used for generations in preparations for the hair and skin because of its astringent, stimulating and anti-ageing properties. Rosemary helps to stimulate the blood supply to the scalp to help with hair loss, and has been used to darken hair for decades and give it a beautiful shine. It is also useful to remember that rosemary’s very good at preventing and ridding the hair of head lice – the creatures hate the aromatic oils! With its high antioxidant levels, turmeric helps to protect the skin from premature ageing and environmental stressors, from pollution to too much sun exposure. Its microbial properties help to heal chronic irritated skin disorders such as psoriasis, and it has been used for centuries topically as an antibacterial in treating wounds, burns and skin infections.